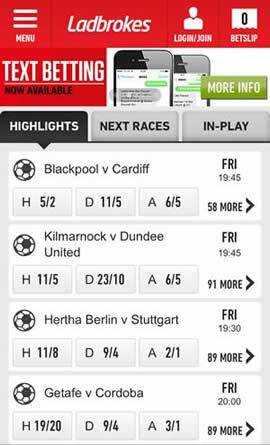 Ladbrokes Mobile Sports offers live sports betting on hundreds of markets, including soccer, horse racing and football. 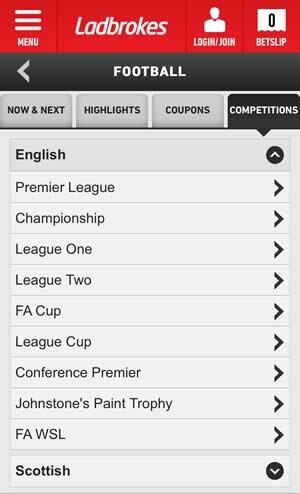 The Ladbrokes app works on iPhone, Samsung Galaxy, Nokia Lumia, HTC and every major smartphone..
Watch live soccer, tennis and basketball (NBA) games for free via the app. As one of the UK biggest bookmakers, they offer expertise in football and racing. Set-up notification alerts for particular horse races and sporting events. 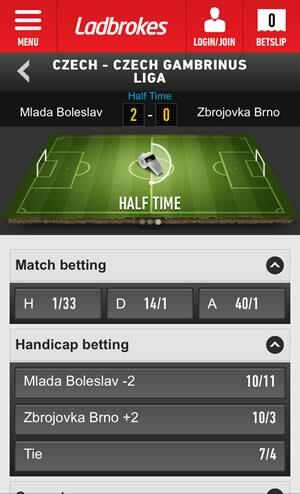 Enhanced betting odds and promotions only available to mobile customers. 2014 has not been a year to remember for Ladbrokes. Their shares dipped to a three-year low in October when the challenge to the UK's new online gambling laws failed. Ladbrokes moved their online sportsbook operations to Gibraltar in 2009 to avoid tax, but the new laws will close that loophole, and experts forecast this will cut Ladbrokes' earnings by a third. In order to maximum their earnings and minimise their losses, Ladbrokes have rolled out their new Sports Betting App, to allow smartphone and tablet users the convenience of laying bets on whichever events they so desire while they are out and about. 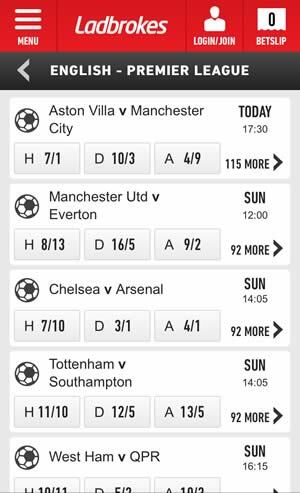 Convenient bet-slip feature to see all your bets in one place. Exclusive daily "Price Boost" offers only available from their mobile software. Benefit from better odds. You can watch live streams of horse races using the app, as well as ATP (tennis), NBA (US basketball), Serie A, French Ligue (football) and South American leagues and tournaments (Argentina, Mexico, Brazil and more). You can keep in touch with events as they happen. Lots of options when it comes to football betting. A good range of e-Wallet options: PayPal, Skrill (ex-Moneybookers), Ukash and Neteller. You can set-up a personalized home screen. Once you have successfully downloaded and installed the app, you'll probably be a little disappointed at how basic it looks, but at least that doesn't take anything away from its functionality. Bedecked in Ladbrokes Red, the top menu gives you access to your betting slip, the deposit function, your current balance and another menu. This second menu gives rise to the most popular betting options, such as Horse Racing, Football, and Ladbrokes “Accies” or accumulators. Moving further down the screen you will find less popular sports for wagering on, such as American Football, Basketball and Snooker. The app can become unresponsive and difficult to use on older handsets, so although everything from 1.5 upwards for Android, iOS 4 and Windows Phone 7 is supported, a more modern piece of hardware will give a more satisfactory performance. The app does not seem excessively speedy either, especially over 3G/4G and lower Wi-Fi speeds. The main screen gives options to big and up-and-coming sporting events – usually football matches unless a big tennis or golf tournament is about to take place. You can flip between the next horse races, and events that are in play that you can still bet upon. If you make a bet on certain events, you can watch the action unfold via a live stream. This is especially good news for horse racing fans who can see how their horse is performing without having to rely solely on commentary. You can also easily make deposits via the app, by registering a credit or debit card, or setting up your PayPal, Neteller, Ukash or Skrill accounts. If you're not confident enough in your self control regarding your gambling, then you can set up deposit limits so not every penny you earn ends up in the bookies' pockets. iPhone/iPad – the app is available from Apple's App Store. All you need to do is search for “Ladbrokes Sportsbook” at iTunes. 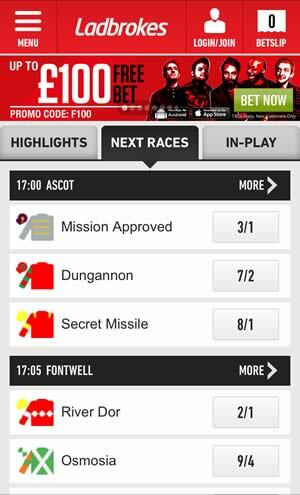 You can also get the app by visiting m.ladbrokes.com on your chosen mobile device. Android (Samsung Galaxy, Google Nexus etc.) – Google's restrictions on gambling apps means you won't find the Ladbrokes Sports Betting App at Google Play, nor will you find it offered as a separate .apk package download. 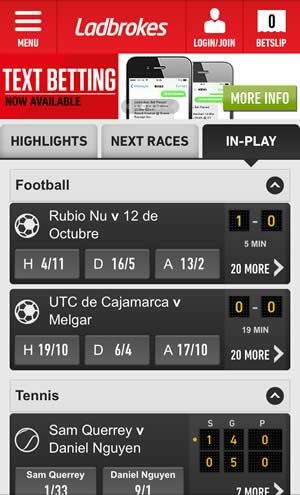 To use the app from your Android-powered device, just visit mobile.ladbrokes.com for a special mobile-optimized version of the web-site. Windows Phone (Nokia Lumia) – the app can be downloaded and installed from the Windows Store. Just follow the exact same instructions as given above for the iPhone/iPad version, but of course searching at the Windows Store, and not iTunes. If you're new to Ladbrokes you can take advantage of a free matched bet that's worth up to £100. 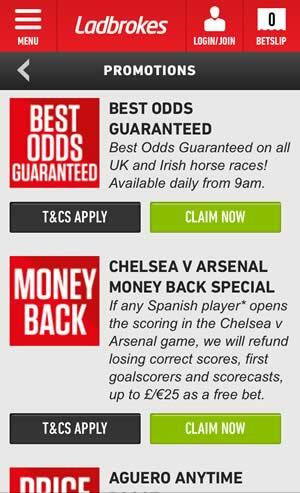 All you have to do is register with Ladbrokes, and then make a deposit of at least £/€5. Ladbrokes will match that deposit up to a maximum of £/€100 as a free bet. Note, you then have to place this wager as a “win only” bet on odds of at least 1/5. You cannot cash out the bet, only any winnings you make from it, and you have to use the bet within seven days of registering, else it is forfeited. Sports (Horse racing, football, American football, basketball, cricket, golf, greyhounds, rugby league, rugby union, snooker, tennis). Others (Aussie rules, baseball, boxing, chess, cycling, darts, floorball, futsal, Gaelic football, golf, greyhounds, handball, ice hockey, MMA, motorcycling, motor racing, music, poker, politics, royalty, speedway, TV & Films, volleyball, weather, winter sports). Via the app you can access the other aspects of Ladbrokes' online gambling opportunities, namely casino, Vegas, games, live casino, bingo, poker, lotto and virtual sports. You can also use Ladbrokes' exchange betting facilities. The Ladbrokes Sports Betting App is one of those apps that “does what it says on the tin” without a great deal in the way of flourish and fanfare. You can quite easily do anything you want with your Ladbrokes account, but don't expect anything to sparkle while you are doing it. You also need a decent smartphone or tablet, and a decent connection. The app can slow to sloth-like speeds at times, and sometimes the app seems to take on a mind of its own as you try and work your way around the menu. The £100 free bet is a nicely generous one, and if you can find a decent wager that matches all the necessary criteria, then you could be in for a small windfall, which would be one perfect way of starting your betting career at Ladbrokes.